I did it because I was always a misfit and was a total failure in any other “normal” activities. I approached each new work, as if time does not exist, with an attitude of exploring the magic space, as if it was an exciting adventure. These times I never set myself a limit for being happy. I lived each collage as if it is a breathtaking adventure, so time was not an issue. Infact, it is as if each time I would step out of time. 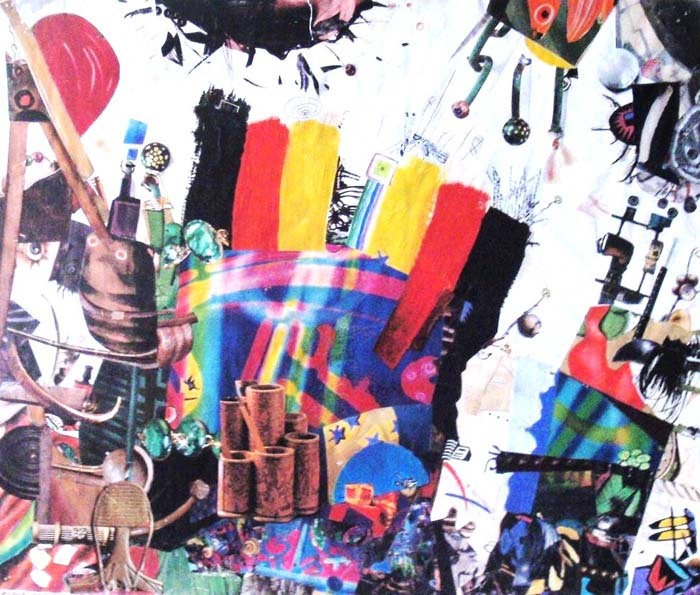 Sometimes it took years for bigger collages, sometimes it took months for smaller ones. I felt like I really live, not just exist in those long moments. 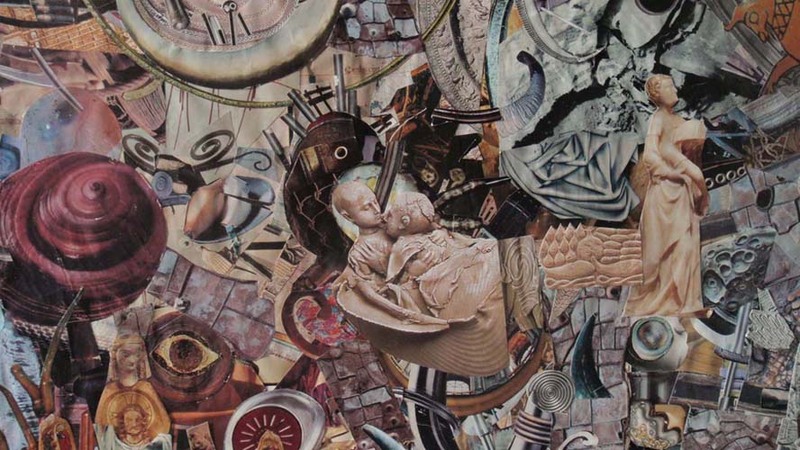 I changed elements around constantly, until I come to a point where nothing can be changed – the final composition, when a collage is like a being on its own. My best collages I did before I began to exibit. It was like sailing into the mist of the open sea with no map. When I began to exibit and all of a suddenly there were many propositions to exhibit, the quality of work went down. I became aware of time. Gallerists refered to work as “pieces”. I thought of my collages as “beings”. So I decided to do completely different things, though applying collage principles. I can not be a part of a modern system, of commercial art. It is a spiritual death. The technique does not matter, it is fun to invent new ones. Infact, I am always inventing something new but what truly excites me, is to invent the simplest possible way of doing what I am doing. I am not a high-tech person. I love “Cinderella art”, the kind when you take rags and turn them into a beautiful dress and turning an orphan peasant girl into an unforgettable princess. No, I never know what it will be look like and what is more amazing. I made my huge collages in a small dark room in pieces. I had no idea of what it will be at the end. I was amazed by myself when I have assembled the collage all together in Gallery Milano and it all fit! Click here to see the finish. – Ability to change things indefinitely. – Working with ready-made materials. – Finding a new, unexpected composition for proposed elements. The beginning of the 20th century, particularly the Russian avant-guard. I need to connect to the invisible force and for that I need to be very quiet, every distraction is painful. Even going to a store to buy milk is disturbing. My most creative periods coincide with most terrible heartbreaks and failures in life. The greatest inspiration usually came when I was left by a boyfriend, had no money and no friends. There was just temporary financial support with a lot of question marks ahead. I was completely disconnected from the “real” world. There is nothing for me when no one is looking for me. Then IT came, tranforming the desert into most astonishing world of happiness. I love classical music and I often listen to it while I work. I love instrumental music, particularly acoustic guitar. I also love profound, poetic songs like from Bob Dylan, Gordon Lightfoot, Okudjava and Vissotskij. But above all, I love the sound of silence. Unfortunatelly, the world we live in conspires to make it unavailable. There are many great quotes. I would not know which one to choose […] Lately I have been inspired by Stoic philosophers and a very interesting book by Irvine, “A Guide To The Good Life”, I would highly recommend it to anyone. It seems to me that if stoic philosophy was adapted by new generations, it would be a true revolution. The radical profound change, so many people are looking for. The driving force of our civilization is dissatisfaction; people’s desires are constantly triggered to want more things. More knowledge, more experiences, … We came to a point where our planet is not enough. We want the entire universe! But given the universe we will be unhappy as well. I can hear laughter of the devil in this unseizable desire of humanity for more space and more knowledge. Stoic philosophers taught people to be content with what one has, to savour with pleasure what one has. I hope and I wish to return to that old wise attitude to life and I hope that art will be instrumental in it. I believe that art has to find again its social raison d’etre. By that I do not mean social realism style art of Soviet times, nor the jaded art commissioned by our government which likes “uplifting, propositive” art. No, artists have to continue doing what they are doing but the way of reaching the public has to be new. Let me give you a few examples by what I mean “new venues”. As I have already mentioned, I rent my studio through airbandb. I have discovered with amazement that travelling young people are looking for strange, unique places. My ARTstudio is located above a bar. There is music till three in the morning. I have ten neighbours using the same washroom, the window does not close properly and yet my art studio enjoys popularity. My friend’s appartment is around the corner. It is by far more comfortable, but no one wants it! Why? Because there is no art in it! So the thing to do for me would be to rent more art studios. Place my artwork in there and let travellers enjoy it in the evening!!! No need for art galleries, thank you very much! And hopefully my visitors will begin to buy something as well, that would be the maximum! This is what I mean by an “alternative way” of exhibiting art! Now I need my artworks myself to decorate spaces for travelling young people! It is a direct connection. They choose my space because of my art work and we can talk about art, my art and art in general, the more so they can see how some new art work is being born! I am also outraged that there are so many hungry people and so much food is being waisted. I began to collect bread from the best bakeries in town and distribute it among artists (most of them are broke, of course). On the bread I add a small tag with a link, to some thought provoking information on the internet. I hope that with time it will grow into a newspaper “Food for thought”. Food without ideas is nothing, especially when a person is uneducated. Why help a poor family save money if they will use it to buy a bigger TV set? For the time being, about a hundred people are fed each week, and that is without any registration or going to a food bank. I just place food baskets in places where poor people go and add links to art on it.